Cottona ❤ Spring / Summer The terrace is open, welcome spring! Time for outdoor dining. Table styling in spring and summer time is a delight - an outdoor tablecloth in a new colour, complemented by new placemats in soft shades and you’ll be laying the table with summer, so to speak. In this magazine, well give you ideas for setting your table and introduce you to the latest colours in our collection. We hope it inspires you to create your own summer table. Will you bring summer to your table with the Basque Country House style? Or maybe decorate the table with the romance of Rooftop Lounge? We’ll give you ideas for styling your table, but feel free to mix and match them to fit your own taste and style. That’s the strength of our wide-ranging collection, the possibilities for creating your own personalised summer table are endless! 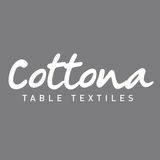 And as always, whatever choice you make will be a choice for Cottona style and quality. Have fun styling your summer table! Outdoor collection • UV-resistant and weatherproof • 100% Dralon® • With Teflon coating • Bespoke also available! Cotton collection • For everyday use • Easy to iron • Washable at 40˚ C • Bespoke also available! Linen collection • Durable product • Very high hotel quality • Washable at 95˚ C • Bespoke also available! Damask collection • Design classic • 100% cotton • Washable at 60˚C • Bespoke also available! Natural linen • Pure nature • Ecological product • Natural flax colour, undyed • Bespoke also available! Glamour collection • Stylish chic • Rich shine • Easy to iron • Bespoke also available! Rugged (imitation) leather placemats. Available in five colours. The warm, rugged look at its best! These (imitation) leather placemats are not only a real eyecatcher on your table but are very easy to clean as well with a damp cloth. Therefor ideal for restaurants and lunchrooms, but of course also handy at home. Versatile in use if you go for a clean look without tablecloth or just donâ&#x20AC;&#x2122;t want your tablecloth stained. Combines beautifully with the natural look of tablecloths, table runners and napkins made of linen or cotton. Tableprotector protects your table against heat, bumps and scratches. Inspired by the summer table styling you see here? You’ll find even more ways to spruce up your table on our website. With the new colours for our tablecloths, table covers, and runners and the new placemats, you can bring summer to your table and create your own personalised table style. 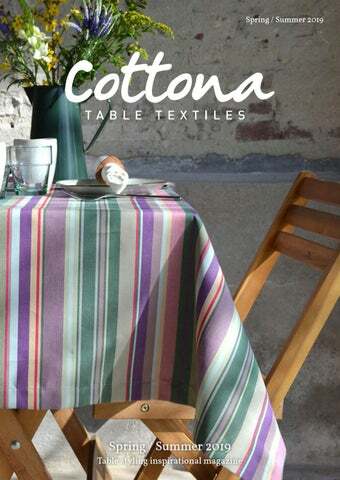 You’ll find even more options for your summer table at cottona.co.uk.